AT this time of year, they are an arresting sight in hues of yellow, with remnants of the spring and autumn in green and shades of brown. Their tall, stately columns rise up at 90 degree angles, saluting the skies. The poplars at this time of year paint a captivating picture, something straight out the nature-inspired canvas of renowned artists like Paramjit Singh. They are so distinct in appearance that one can spot them from a distance, on IT Park road, in Sector 14, towards the southern sectors, and mostly on the peripheral farm land, for these are trees that enjoy a tremendous commercial and environmental advantage. Populus nigra is a genus of 25 to 35 species of deciduous flowering plants from the Salicaceae family. The Populus or Popular or Black Poplar are indigenous to Europe, northern and western Asia and northern China. In India, they are extensively used in agro-forestry in Haryana, Punjab and the Western Himalayas. The varieties planted in Punjab, Chandigarh or Haryana do not flower. Fast growing trees, poplars are harvested as energy crops for biofuel. HAFCO (Him Agro Food Corporation) India’s motto was ‘Poplar Lagayen Khushali Layen’ (krishijagran.com). Not only does the poplar reduce carbon dioxide in the environment, check global warming and increase oxygen percentage, it also checks erosion, purifies water on riverbanks, and restores gravel beds and polluted soils. 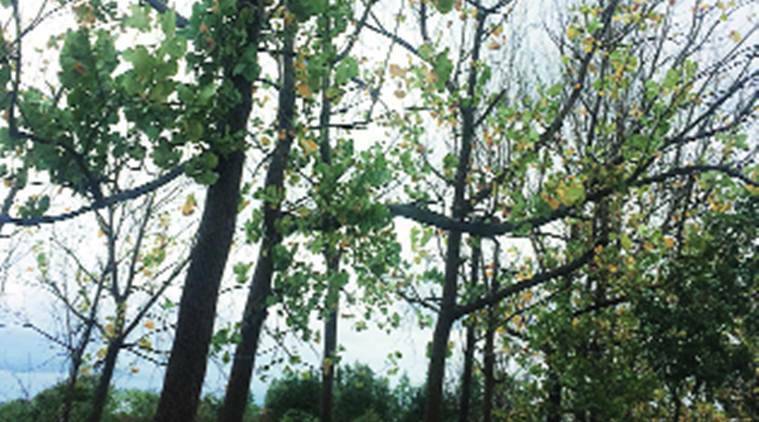 Poplar farming is the reason Yamunanagar is rich in the plywood industry. It was introduced here in the 1980s. Today, Jagadhri and Yamunanagar, Haryana, have hundreds of factories. Poplar wood is handy in the paper industry, and in making boards, matchsticks, packaging sports goods, and stringed instruments. It is even used in Italy for paneling paintings like the Mona Lisa. In ancient times, it was even used for shield construction by the Greeks because of its strong yet light nature. No wonder it is popular!